I can sit at my grandmother's kitchen table and see the hard slant of summer light across the garden below. At the edge of the porch it gets caught in the mitt of a grape leaf, big as a hand. The white, two-story house pants in the sun. From the kitchen porch, high above the yard, my grandmother watches, clucking and laughing, wiping sweat from her nose. The drapery wilts in the heat. Even with the air conditioning up, little pools of sweat gather behind my knees and stick my legs to the wooden chair. My feet dangle above the floor. But gooseflesh is a virgin tub of frozen Cool Whip laid before me, white like snow, and a glinting spoon. It is mine to finish if I want. That is my grandmother's way—earn our love, or buy it. Below, my grandfather has soaked through his thin white undershirt. He works, lean and agile, to hoe a furrow in the dirt. He stops to mop sweat from his eyes, sending a small streak of mud down his cheek. When he kneels to place seeds in the row, it is as if he's praying. In my grandfather's garden it is forever summer, the sky aluminum blue and crackling hot. From my refuge inside the shade of raspberry hedgerows, green leaf after green leaf is stamped against the sky. My work is to search for bright buttons of fruit stitched to the leaves, tipping my head up till sweat stings my eyes, tiptoeing in the scuffled dust, tugging the thread gently so the heat-sick berries don't collapse into juice. 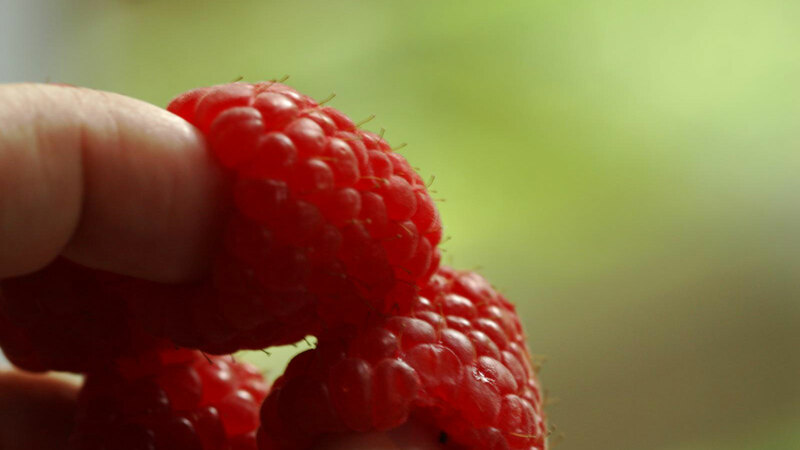 I pluck and pluck until each of my fingertips wears a raspberry knitted cap. Then I eat: finger, finger, finger, finger, thumb. For a while I lived on something like a farm. Under the turpentine-smelling canopy of pines, we kept a young steer, some escapist pigs, deranged turkeys, an omnivorous goat, and, briefly, rabbits. We butchered the steer, a young male cow we called Buster. A man came while we were in the basement watching cartoons and took him. Later, we could go to the shop in town and the butcher behind the counter would bring us large, frozen lumps of him wrapped in brown paper. My father was the town doctor. Some of the animals we ate came from patients who didn't have enough to pay him otherwise. But much of our meat he hunted and killed himself—venison, partridge, wild turkey. Once, he dressed a deer in the basement, the whole body strung up on rope over a blue tarp to protect the carpet from blood and skin as he peeled it away from the flesh. Rabbits were the only animals my father couldn't kill. They screamed like infants right before you broke their necks. He didn't believe in inconsistency or in mourning animals, but after the first time we never had rabbits again. We ate the meat from Buster for nearly a year, I think. Possibly, there was still some of him left when my father died. But they have ways of loving us quietly, too. First and always is prayer. If they tried to do us all at once, they'd be up all night. Instead, they have divvied us up and we each get prayed for one night a week. If things are bad, we go into full rotation. Their prayers have considered their children, who face foreclosure and homelessness, a birth and then immediate heart failure, alcoholism and suicide, abuse and adultery. Their prayers have considered their grandchildren who struggle to finish school, to get pregnant, to kick heroin, to survive bulimia, to make it out of jail, to grow up, to find love. Whether we choose to be aware of it or not, they go on weekly, their hearts spilling out in our many directions from the shag-carpet basement of their little white house. But my grandfather also prays with his body. The garden is his central offering, his life's quiet work. It is more important to him than anything but God and all of us. Just as he tithes from his meager income to the church, he sets aside the best of his vegetables and fruit each year, saving the seeds for next season's garden, a gift to the future. He brings the seeds to family weddings and funerals, pockets full of them, and giddily doles them out. That is also his way of spreading love around. This farm was a real farm and it was supposed to be ours, a few hardscrabble acres outside of Albany, Oregon. It belonged to my father's grandmother, and he was more or less raised there. He bought it from Nanny before they both died. He was going to doctor the people of these rolling hills. We were meant to have another cow, and his dog Ginger was meant to hunt with him for partridge in the tall grass. We were meant to be country kids. But when he died before his own grandmother, my mother sold the farm back to her. We moved 2,800 miles away and that version of my life vanished before it could begin. A few years ago, I visited. Another of Nanny's grandchildren owns it now, but they were off hunting elk when we arrived. My husband and I camped alone in the front yard. There was an owl telling us to go to bed. As we lay in our tent listening to the wind tangling in the branches of the windbreak, the life I might have had flooded past me. We'd have had animals in our front yard. I would have known how to milk a goat and hang a deer. I would have used a chain saw and shot a proper gun. I would have named the animals I ate. Perhaps, some of them I would have killed myself. My grandparents' love is epochal, lifelong, etched in stone. Should you at any point decide you don't want it, that's your cross to bear. It will be there, waiting for you to falter, waiting for your time of need, and then it will collect the kindling of your waywardness and set a fire and cozy the cinders back to the family cairn so you will know the trail is there. Try getting lost. That was the theory, anyway. With my father's generation, they set a lot of fires. They were burning with love for their children, but also with Christ, and there was lots of kindling. Everything was possibly the devil in those children, but especially in my father. He put a half-severed snake in Aunt June's bed. He killed his sister's cat. He fed his little brother a whole pack of laxative gum until the poor thing had let his insides all the way out. There was Connie, the preacher's expert daughter, who he snuck off and married at seventeen. There were the antics in college—practical jokes but then also the tree spiking and Mao's Little Red Book and the shaggy hair and the drugs. There was medical school and his genius. There was the divorce and then the Presbyterian, my mother. We were the children and erased some of his sins. He became the country doctor, charismatic and beloved. There were some irregularities. Then there was rehab and the letter of finding God again. A week later, there was nothing—a needle threaded with cocaine, a casket. I think often of the taste of my grandfather's grapes and of the meat from my father's knife. Both were unlike anything I came to understand later. My favorite grape was called Neptune: a perfect purple orb with dusty skin, so full of sugar it would split with just a little nudging from your tongue, the tart skin slipping to one side of your mouth like a dress falling to the floor. Every bit of meat at my father's table communicated something about the life of the animal it came from—how wild or big or well fed it was. It was so obvious as to be unmentionable: that when you ate this meat you took one being into your own. No knowledge can outlive the mechanisms we have to pass it on. When my husband and I moved to Oregon, back to a place where my great-great-great-great-great-grandfather had laid the cornerstone of a church in 1848, a little morsel of the knowledge that was my birthright returned. Merely putting my foot on the ground here felt like a return. Something in my bones recognized this place, and some submerged knowledge surfaced. I started a garden. Planting seeds my grandfather gave us, which he had perhaps first propagated in a time when my father was still alive, was a paradox of time. I was grown myself, but still my grandfather reached across a generation and began to teach me to grow things. He is giving me an inheritance that will last, if I am a good steward of it, until I have my own grandchildren. But I'll never get back everything I lost. My father can't teach me to skin a deer or shoot a turkey. He can't teach me the names of all our bones. I'm not sure, anymore, that I want him to. That might be the central mystery of love. Because what would going back mean? If we hadn't left the farm, I wouldn't have met my husband, 2,800 miles from Oregon. My brother wouldn't have walked me down the aisle, which is one of the perfect moments of my life. I wouldn't have known so well that you can find joy in the rubble of grief. Hanna Neuschwander is the author of Left Coast Roast, a guidebook to artisan and influential coffee roasters on the west coast. Her writing about coffee and food has appeared in publications including Travel + Leisure, Edible Seattle, Portland Monthly, and the Oregonian, among others. She is also the managing editor of the scholarly journal Democracy & Education and director of communications at the Lewis & Clark Graduate School of Education and Counseling. If her grandparents hadn't moved briefly to Eureka, California in the 1960s she would be an eighth generation Oregonian. Cover photo by Sharyn Morrow. Beyond the Margins is a monthly online essay presented by Oregon Humanities magazine. You can sign up to have Beyond the Margins essays emailed to you here.